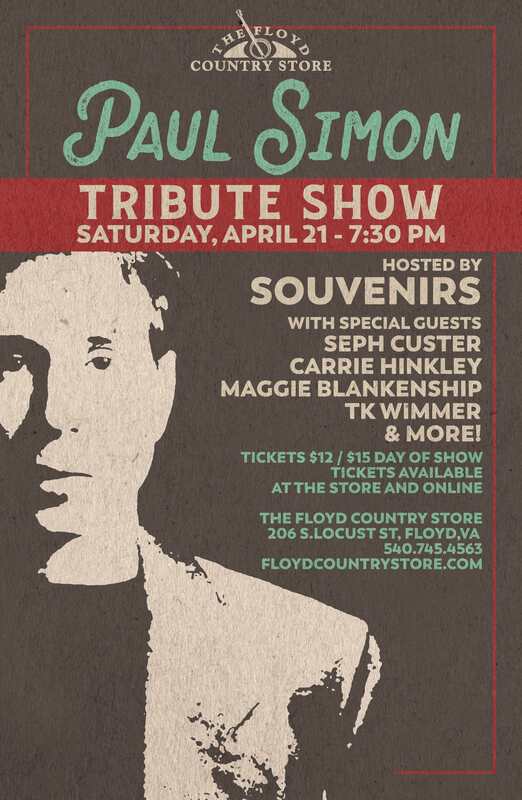 The Floyd Country Store presents Paul Simon Tribute Show on Saturday, April 21, 2018. Enjoy a live tribute for Paul Simon hosted by Souvenirs members David Cannaday, Dave Fason and Rusty May and featuring special guests Seph Custer, Carrie Hinkley, Maggie Blankenship, T.K. Wimmer, Alex Young and more! At Forest Hill High School, Simon and Garfunkel formed a duo called “Tom and Jerry.” They’d occasionally perform at school dances, but spent their free time in New York City at the famous Brill Building, pitching Simon as a songwriter and the duo as demo singers, for which they’d get paid $15.00 a song. In 1957, they pooled together the money to cut a single, “Hey Schoolgirl,” and had their first hit at the age of 15. This landed them a spot on American Bandstand, going on right after Jerry Lee Lewis. After Simon and Garfunkel split up, Simon went on to have a stellar solo career. Paul Simon has been the recipient of many honors and awards including 12 Grammy Awards, three of which (“Bridge Over Troubled Water”, “Still Crazy After All These Years” and “Graceland”) were albums of the year. In 2003 he was given a Grammy Lifetime Achievement Award for his work as half of the duo Simon and Garfunkel. He is a member of The Songwriters Hall of Fame, a recipient of their Johnny Mercer Award and is in the Rock n’ Roll Hall of Fame as a member of Simon and Garfunkel and as a solo artist. His song “Mrs. Robinson” from the motion picture “The Graduate” was named in the top ten of The American Film Institute’s 100 Years 100 Songs. Tickets are $12.00 in advance and $15.00 the day of the show. To purchase tickets online, visit: https://www.floydcountrystore.com/event/paul-simon-tribute-show-2018-04-21. To view the event flyer, visit: https://i.imgur.com/Qx01FOG.jpg. For more information, visit: https://www.floydcountrystore.com/event/paul-simon-tribute-show-2018-04-21 or https://www.facebook.com/floydcountrystore or call 540-745-4563.